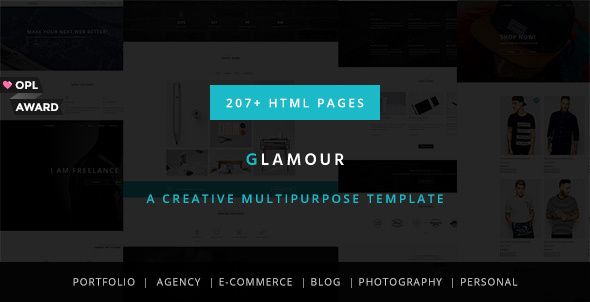 GLAMOUR is a Powerful Multi-purpose Multi page and One page template. This template is made for Portfolio, Agency, Business, Photography, Architecture, Landingpage, Blog, E-commerce, Freelancer, Designer and others. You will find many powerful features and huge amount of shortcodes Also Glamour has megamenu support 80+ portfolio variation. Also We have included Revolution Slider. Glamour is more powerfull, than you think. Hope you will love it.